The School of Design in Chicago is a non-profit corporation for the training of creative workers in art, design, architecture and teaching. Its educational policy is based upon the belief that talent is potential in everyone and that the function of education is to uncover it, activate it and develop it. The school has found that this can best be done through a professional training as broad and thorough as any education for higher learning: that the person who is trained only in art, or only in science, or only in science, or only in tools, materials and technological processes, is only partially educated. The solution lies in an indivisible education, integrating manual and intellectual work including all possible contemporary resources. theoretical and workshop training. Nothing is taken for granted – neither the extent of the student’s capabilities, nor the finality of inherited knowledge. Self-discovery follows upon re-exploring tools and materials, self confidence with the breaking down of complex tasks into their fundamentals. introductory statements are limited to a minimum. Work begins at once and self criticism develops naturally as the work proceeds. The function of the faculty is to give technical supervision and creative direction. Members of the faculty, currently active in their own fields, set the student on the pathway to his own discoveries and experiences, and then see to it that he takes full advantage of the tools, materials and other forces which are ready at his command. Fees: Payable on registration day. …In connection with National Defense, a course on – The Principles of Camouflage will be introduced. 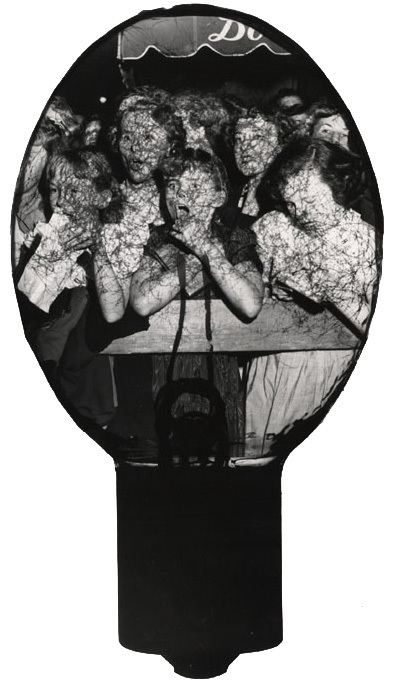 This entry was posted in Fans in a Flashbulb and tagged 1942, Bauhaus, Chicago, education, Laszlo Moholy-Nagy, school, School of Design, summer. Bookmark the permalink.